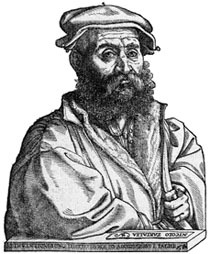 Niccolò Tartaglia (according to the name adopted by himself after the injuring in 1512) lived and worked in the first half of the 16th century. Tartaglia is famous for some fundamental contributions to mathematics, such as algebraic solution of cubic equations, and to physics, such as the study of the motion of falling bodies applied to ballistics. Self-taught mathematician, is considered one of the most important mathematician of the 16th century. His real name was Niccolò Fontana but is universally known by the nickname Tartaglia. Such nickname cames from the stuttering that afflicted him since he was a boy as a consequence of a wound at the throat inflicted by a French soldier during the sack of Brescia in 1512. He teached math in Verona in 1521 and in 1534 he went to Venice where he stayed until his death. He gave a great contribution to the solution of cubic equations that he never published. After much insistence he revealed to Cardano his method. Cardano, contrary to the promise that he made to Tartaglia, published it in 1545 in the Ars Magna . The enormous development of artillery was a basic feature of the sixteenth century. It caused the development of theoretical studies related to the motion of the projectiles. In this field Tartaglia was one of the leading experts. In fact , in 1537 , he wrote the "Nova Scientia " , that is the first work on the ballistic theory. In this work there is also the recognition of the curvature of the projectile trajectory. In 1543 he published in Venice the first Italian translation of the Euclid's Elements and a Latin edition of the works of Archimedes. Tartaglia is also remembered for the formulation of the algebraic rule known as the Tartaglia's Triangle.